Do I have a risk of being deported? There is a massive immigrant population in southeastern Michigan. When an individual who is not a citizen or lawful permanent resident of the U.S., such as an admitted Alien, is “convicted” of a crime it is likely there will be immigration consequences. This applies to all non-citizens regardless of how long they have resided in the United States. A non-citizen being charged with a crime is generally not enough to trigger immigration concerns. In some serious felony cases, U.S. Immigration and Customs Enforcement (ICE) can detain someone who is deportable pending the outcome of a criminal matter (this generally occurs in Federal Cases only). A “conviction” for immigration purposes is either a finding of guilt or admission of guilt or a plea of no contest to a criminal allegation. A common misconception is that probation or a suspended sentence will not lead to deportation. This is not true. Another common misconception is that a plea taken under advisement or a deferred sentence will avoid potential deportation so long as a criminal conviction is not entered. If an immigrant takes a plea and a sentence was is pending compliance with certain conditions, a conviction still occurred and that person is deportable. This is true even if a conviction is never entered in the criminal charge. Another myth is that deferred judgments do not cause immigration consequences. However, all that is required for a conviction under immigration law is an admission of the elements of an offense and imposition of a sentence. Probation counts as a sentence and, in many cases, the maximum sentence that could be imposed under Michigan law—not the actual sentence imposed—determines whether a person can be deported. Juvenile offenses and vacated sentences are not considered to be deportable offenses, yet sentencing under the Holmes Youthful Trainee Act will likely trigger immigration consequences. What types of crimes can trigger deportation? Crimes that trigger immigration issues under the Immigration and Nationality Act (INA) are either “aggravated felonies” or “crimes involving moral turpitude”. The commission of certain crimes will render an Alien inadmissible or removable, and at times, both. Aggravated felonies are listed in the Federal Immigration Statute (8 USC 1101(a)(43)) and include many crimes that are not considered felonies in Michigan. In those cases where an alien who was admitted to the U.S. within five years of committing an aggravated felony he or she becomes immediately removable. Immediate removal is a form of expedited removal under the INS. Crimes involving moral turpitude (CIMT) are not listed in the Immigration and Nationality Act but comprise conduct that is “inherently base, vile, or depraved, and contrary to accepted rules of morality.” A conviction that qualifies as a CIMT will render an Alien inadmissible or removable. Examples are retail fraud (shoplifting), theft, fraud, domestic violence, spousal abuse, child abuse, OWI, DUI and driving under the influence without a license. Though an offense on its own is not a CIMT or an Aggravated Felony, an alien who is convicted of two crimes, regardless of their classification under INA is immediately inadmissible. Crime Involving Mortal Terpitude within Five Years of Entry into U.S. Under INA Sec. 237, an Alien convicted of a CIMT punishable by a year or more within five years of admission to the U.S. becomes immediately removable. How does country of origin impact deportation after a criminal conviction? When deportation is an issue the country where the person is possibly being deported to and the potential consequences of their deportation can be considered. For example, it may be less likely that a non-citizen who is originally from Iraq or Afghanistan would be ordered returned to their former home in light of the political upheaval going on. Also, it can be argued that a person who would be subjected to torture if they were returned to their home country should not be deported. People threatened with deportation do have the right under most circumstances to have a hearing to determine if their deportation is warranted and a great immigration lawyer must be hired under these circumstances. If I’m convicted of a crime, can I re-enter the United States? If found Inadmissible, pursuant to INA Sec. 212, an Alien outside the United States seeking a visa to enter the U.S., or an Alien within the U.S. seeking to adjust their status to a Lawful Permanent Resident (colloquially referred to as a Green Card Holder), will be barred from doing so, due to the charges brought against them and possible conviction. What happens to the family of an alien who is deported? Clearly, the aforementioned demonstrates the steeply negative consequences that a conviction under State or Federal law can have on an Alien’s immigration matters. Such convictions may force an Alien to depart the U.S. and leave behind immediate family members, such as a spouse, children or parents. Further, for an Alien who is eligible to adjust status to a Lawful Permanent Resident of the U.S., such a conviction may bar them from doing so. If you are a non-citizen or Alien charged with a felony or misdemeanor crime, it is critically important that you understand the risks that you face. You should have the representation of an attorney who understands that you are faced with a two-pronged dilemma of the crime charged and possible deportation. 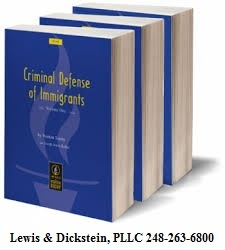 The criminal defense law firm, LEWIS & DICKSTEIN, P.L.L.C., has more than fifty years experience dealing with criminal and immigration law issues. Please complete a Request for Assistance Form and one of our highly competent attorneys will contact you or call us directly at (248) 263-6800. Immigration officials and judges have wide discretionary authority to grant or deny various types of discretionary immigration benefits. If you need to consult with an immigration lawyer regarding deportation, removal or re-entry, or any other criminally related immigration question, you should know that not all immigration lawyers are equal. Over the course of almost two decades of dealing with a multitude of immigration attorneys advising clients on criminal issues, it is clear that some are much more knowledgeable and effective than others. Whether LEWIS & DICKSTEIN, P.L.L.C. is representing you in a criminal case or not, we can help you find the right immigration specialist to help you. Please give us a call at (248) 263-6800 or fill out a Request for Assistance Form and we will assist you in finding an immigration lawyer who is right for you.